I started making Quicker No-Knead Bread when I realized, poop, I don’t have 3 cups of bread flour left. Grrr…I used what I had and then decided on whole wheat flour for the rest. I had been wanting to try a whole wheat version but didn’t have the guts, cause I knew I would cry if the bread didn’t come out well. I need my bread! Forced into this experimentation, I’m happy to report that this No-Knead method is resilient and you can substitute a bit of whole wheat in there. I thought it was very little whole wheat but it did make a significant difference in taste and look. 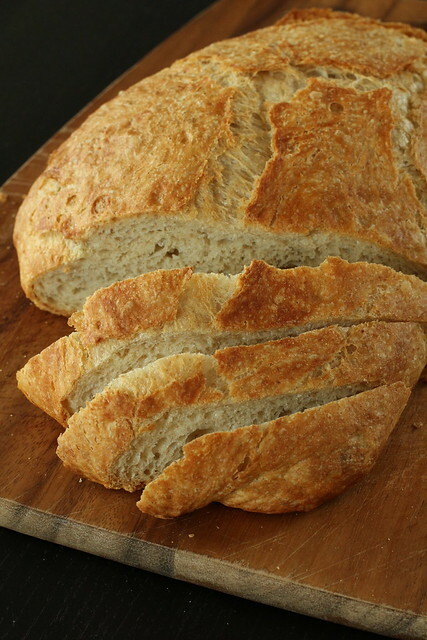 There’s little specks of brown that give it an even more rustic look and the light taste of whole wheat is a nice change. I think the holes might be smaller too. 2. Cover with plastic wrap and leave in room temperature for 4 hours. 3. Oil a board. Place dough on board and fold over once or twice. Cover with platic wrap again and rest for another 30 minutes. Preheat oven to 450 degrees, with a heavy pot (with lid) inside (at least 30 minutes before baking bread). 4. Carefully remove the pot from the oven. Open the lid and throw dough in. Give it a strong shake, cover and put back in oven for 30 minutes. Remove the lid and bake for another 15 minutes, or until golden and sounds hollow when you tap. posted by jessica	at 02:58 PM	Filed under Bread, Recipes. You can follow any responses to this entry through the RSS 2.0 feed. Both comments and pings are currently closed. That bread looks so lovely:: but isn ‘ t that a lot of salt in 1 bread? I don’t like too much salt in a bread. Did you used less salt before? Wow that is super easy. I read somewhere, even for the no knead bread, it will still need all day for it to rise and that person woke up really early to make bread for dinner. I didn’t know it only takes a few hours. I will definately try this out. But if I don’t want to make whole wheat, how much bread flower would I use? 3 cups? 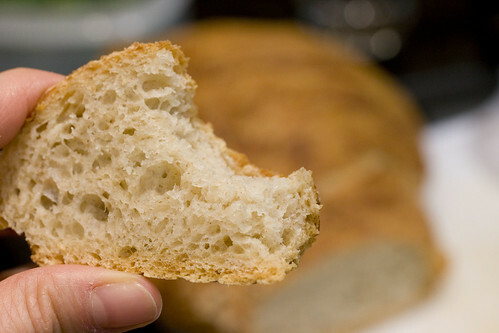 Sophie, that’s how much salt I always use in this bread, which is just the recipe Mark Bittman posted in the NY Times. Everyone loves it. Wonders, the original No Knead Bread takes x hours and the Quicker No Knead Bread takes about 5 hours. …yes, 3 cups bread flour. oops, sorry for the “x”…the original takes 15 1/2+ hours so you don’t get up early to make it. You just start the dough the night before and leave it till ready to bake. Jessica, Why the 2 Tblspns of bread flour? Sorry I missed the party. Marcos, the original recipe was 3 cups of bread flour and 2 1/2 + 2 tablespoons is just what I had left.